- 906 (1" Deadbolt Latch, 1-3/8" - 1-1/2" Thick w/ Key Override). - Select Finish: Satin Brass (04) or Satin Chrome (26D). - Delivery: The Simplex 9060000 Pushbutton Lock is in stock and available to ship. - Special Orders: For pricing on any Simplex 900 Lock not on this page please contact Taylor via e-mail (sales@taylorsecurity.com) or call 1-800-676-7670. The Simplex 900 Series mechanical pushbutton lock provides fully mechanical access control, while allowing free egress at all times by interior thumbturn. Deadbolt models must be manually relocked. Deadlocking spring latch models automatically relock each time the door closes. This fully mechanical lock eliminates the material and labor expense of battery replacements, has a single access-code and is programmed via the keypad without removing the lock from the door. Locking Device: Deadbolt - 1" throw, manual relock. Deadlocking Latch - 5/8" throw with automatic relock. Handing: Field reversible latch; invert the lock for right-hand doors; roman numerals are easily read in either orientation. Optional Key Override: Can be used to override the lock combination and gain access using a key. Allows facilities to initiate or maintain a master-keyed security system. Door Thickness: 1-3/8" - 1-1/2". Strike: Includes strike plate for outswing doors, cast box strike for inswing doors; metal door frames require the optional surface mortise box strike or use of an adapter kit. Backset: 2-9/16" for outswing doors, 2-1/2" for inswing doors. Finish: Satin Brass (04) & Satin Chrome (26D). - 906 - 1" Deadbolt Latch, 1-3/8" - 1-1/2" (35mm - 38mm) Thick w/ Key Override. 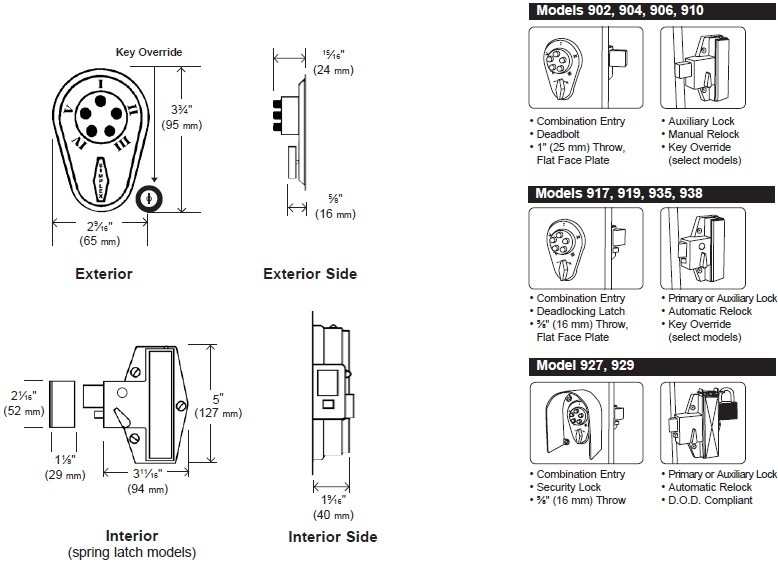 Special Order Information: For pricing on any function, keyway or finish of the Simplex 900 Series not found on this page please contact Taylor Security direct via e-mail (sales@taylorsecurity.com) or call us toll-free at 1-800-676-7670. Backset: 2-9/16" (65mm) for outswing doors, 2-1/2" (64mm) for inswing doors. Door Thickness: 1-3/8" (35mm) to 1-1/2" (38mm) or 1-3/4" (44mm) to 2-1/8" (54mm). Items Supplied Include: Installation manual, full-scale template, strike for inswing and outswing doors (appropriate to latch type), and required installation hardware.